Luvienz company created Luvienz® Caviar Edition in 2014, a unique beverage that combines the beverage of the Kings and Caviar. Luvienz is about to launch the treasure chest, a customized piece, fruit of the savoir-faire of the finest French artisan. A work of art in its own right, the Luvienz chest features sumptuous pearled leather with the classic elegance of wood. Fruit of the savoir-faire of the finest French artisans, Maltier le Malletier, the chest is meticulously crafted in workshops committed to carrying on a long tradition of excellence in luxury carrying cases. There are only 999 chests produced every year for the entire world. These are unique, numbered, customized pieces, reflecting your lifestyle. 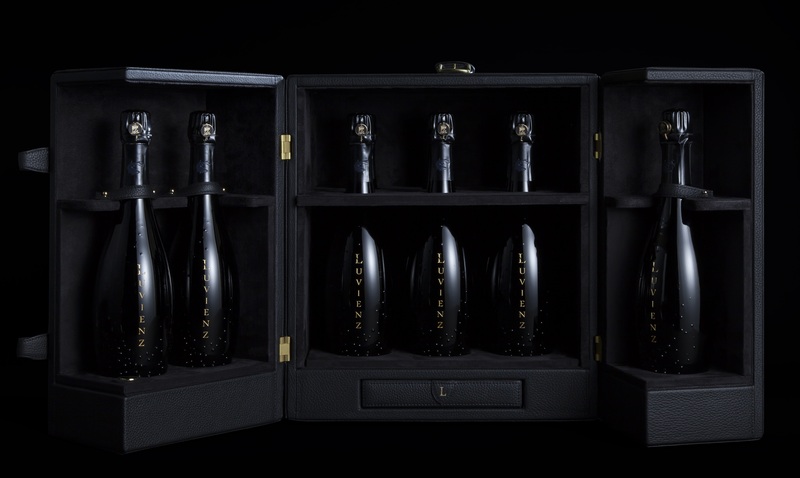 And each luxury chest encloses an invaluable treasure: nine bottles of Luvienz. An exceptional beverage deserves an exceptional bottle. The original design of the Luvienz Caviar Edition bottle, elegantly compliments the precious nectar it contains. More than one year of Research was necessary to fit the different technical constraints linked to the conception and manufacturing. On the glass surface, elegant bubbles run in an embossed design, thus recalling the grains of caviar and the effervescence of the beverage. Produced in Haute Normandie, each bottle is meticulously crafted by Waltersperger, a master glass blowers from the Vallée of Bresle. These renowned artisans that works for Dior, Chanel are perpetuating a tradition that goes back to the 15th century. Imagined by Guillaume Laborie and Leevy Pennaneach, the two founders, Luvienz began as a persistent dream, an unappeasable obsession: to combine the two most prestigious symbols of Gastronomy in one extraordinary beverage. 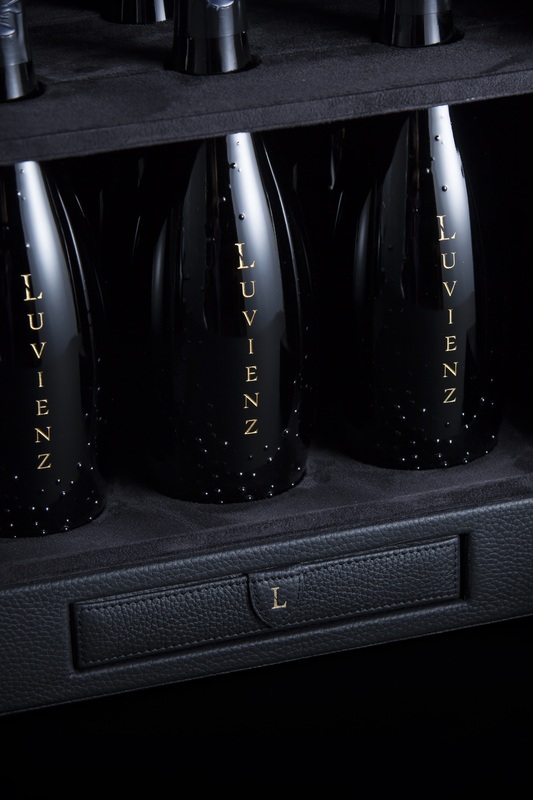 After years of research and close collaboration with sommeliers, enologists and cellar masters, the dream has finally come to life in Luvienz, which perfectly blends the effervescence of the noblest of beverage with the divine refinement of Caviar. Elegant, intense and supremely subtle, the delicate iodized notes of Luvienz along with its bewitching black robe will enchant even the most discriminating connoisseurs. Luvienz has selected the Chardonnay grape variety that comprises most of the Cote des Blancs premium vineyards. Much sought after, wines made from this renowned grape variety are ideally aged and have an infinitely delicate aromatic contour. Produced by one of the most renowned houses, the Caviar selected by Luvienz is characterized by marine and almond notes. The exceptional ingredients brought together by Luvienz are meticulously combined following a secret recipe. Through grinding, pressing, and filtering at controlled temperatures, a caviar extract is obtained and then blended with the finest French sparkling wine by Luvienz® artisans. This revolutionary, patented extraction process, the fruit of many years of research, concentrates all the gustatory and olfactory qualities of the Caviar.